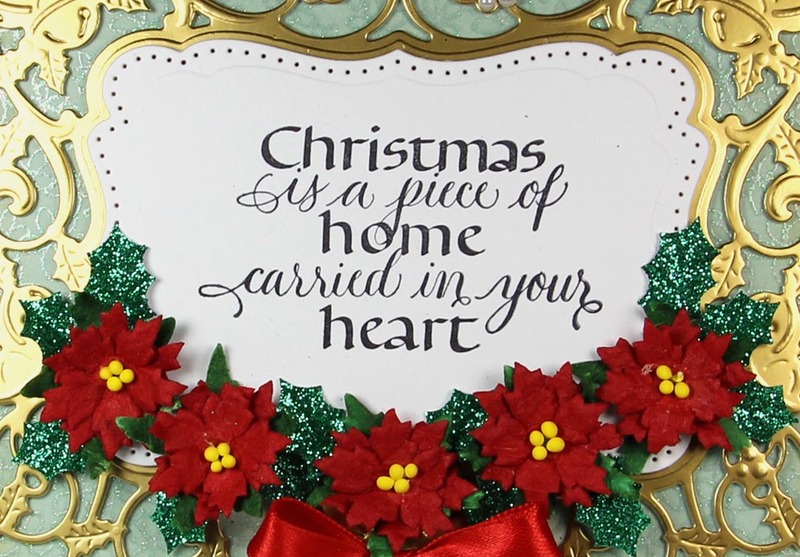 Yvonne here today sharing a Christmas card (yes I know it's still summer...lol...but it'll be Christmas before yoyu know!) using the one of the newest Christmas stamps by Quietfire Design. 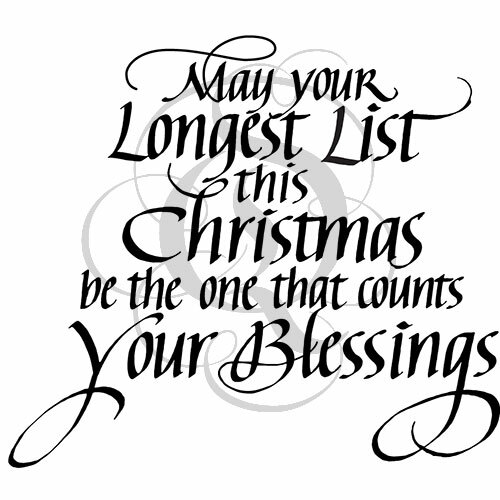 I hope you like the card and I'm looking forward to your comments. Happy Wednesday!!! It's Wanda here today. Christmas in July, you see if everywhere, and it does get us thinking doesn't it. 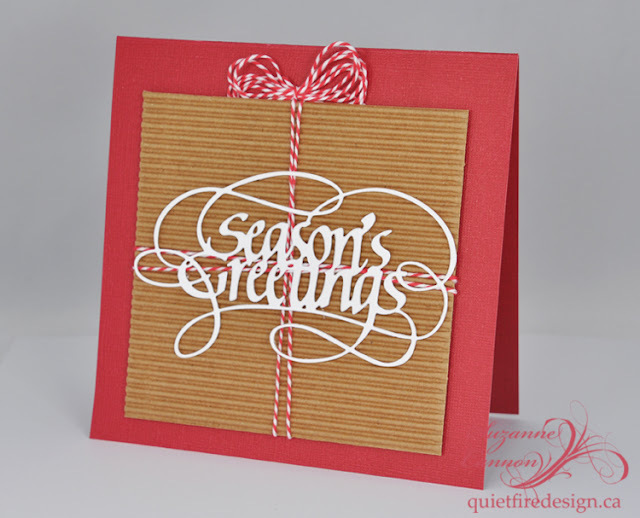 So I've made a Christmas card for today using the new Quietfire Design stamp, May Your Longest List This Christmas. Onto a white base I've layered a green panel that has splatters of gold paint and gold around the edge. 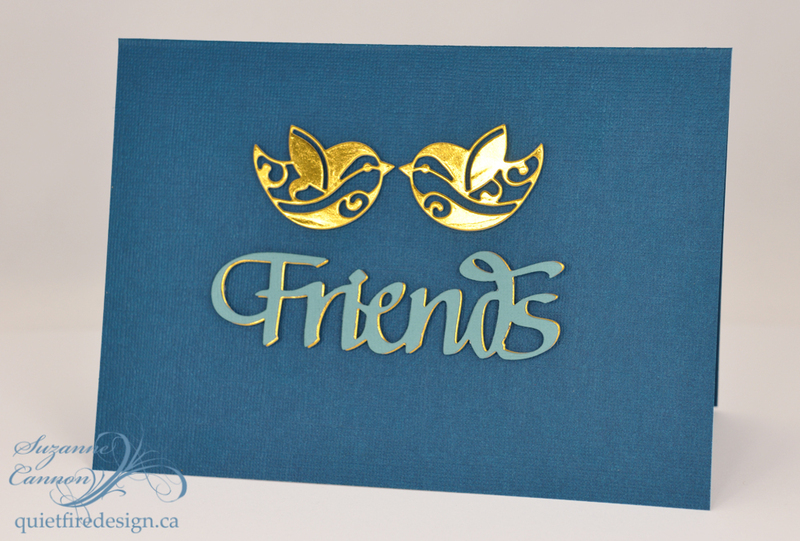 Next is a white panel embossed with the ECD folder #119 Swirly Curves and edged in gold. 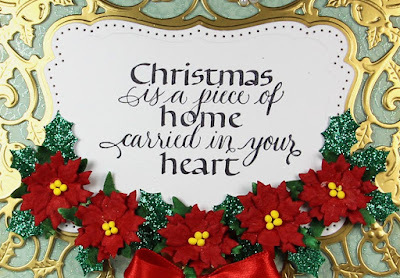 The quote is stamped with Archival Ink vermillion onto white card, Distress Ink pine needles and peeled paint are sponged around the edge and then the edges really distressed. This is layered to a red panel with very distressed edges. 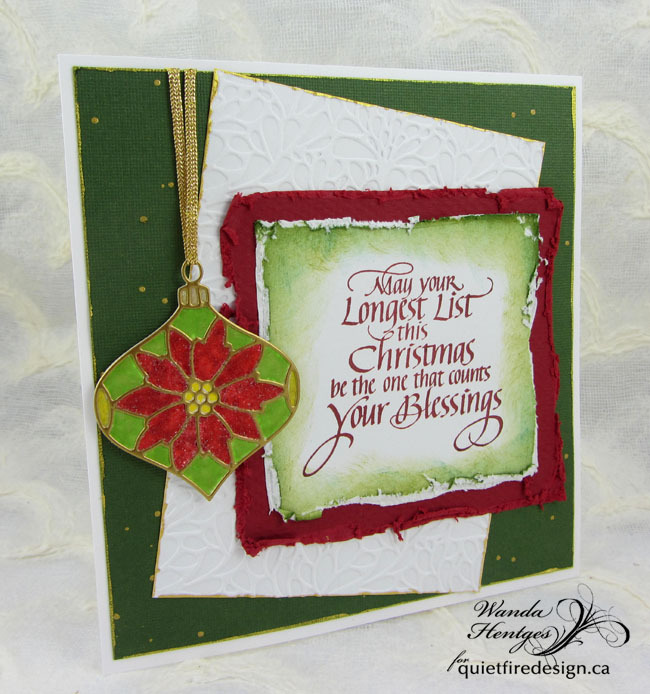 The ornament is made with the ECD die set #762 Ornament Set 2. 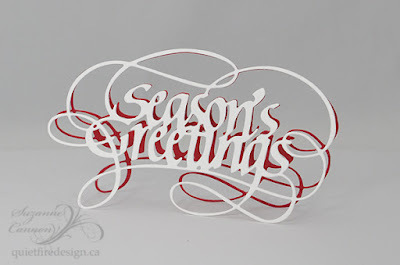 The whole ornament is cut from white card. The decorative top is cut from gold card with adhesive on the back. After sticking them together I colored in the openings with either Distress marker (festive berry, twisted citron, shabby shutters) or Posca paint pens (gold, yellow). 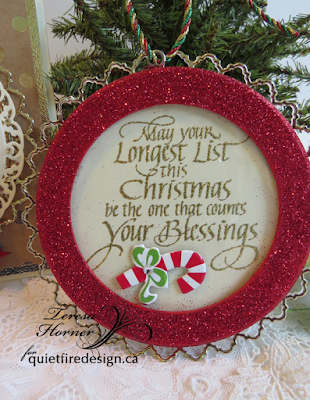 Over the red areas I added Glossy Accents and clear glitter. This set has been used on many of my crafty projects and will continue to do so. 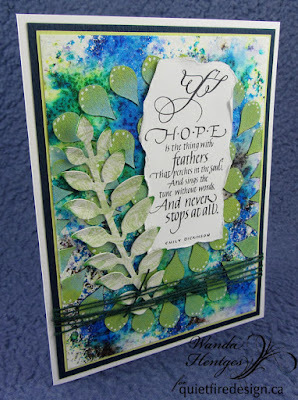 Usually I use lighter or pastel colors with the stamps from this set but this time I was in an inky finger vintage mood. I like the colors popping out from behind the Sizzix Thinlits Mixed Media die cut corner (Peeled Paint, Tumbled Glass, Scattered Straw, Vintage Photo). 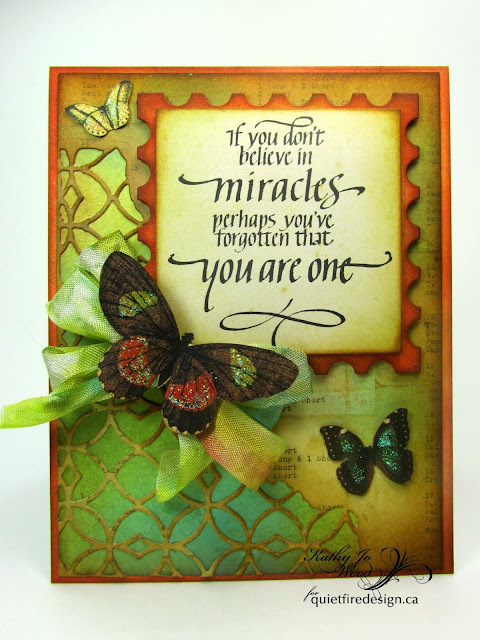 The colors are a nice contrast to the colors on the Spellbinders Postage die set (Abandoned Coral, Scattered Straw, Vintage Photo). 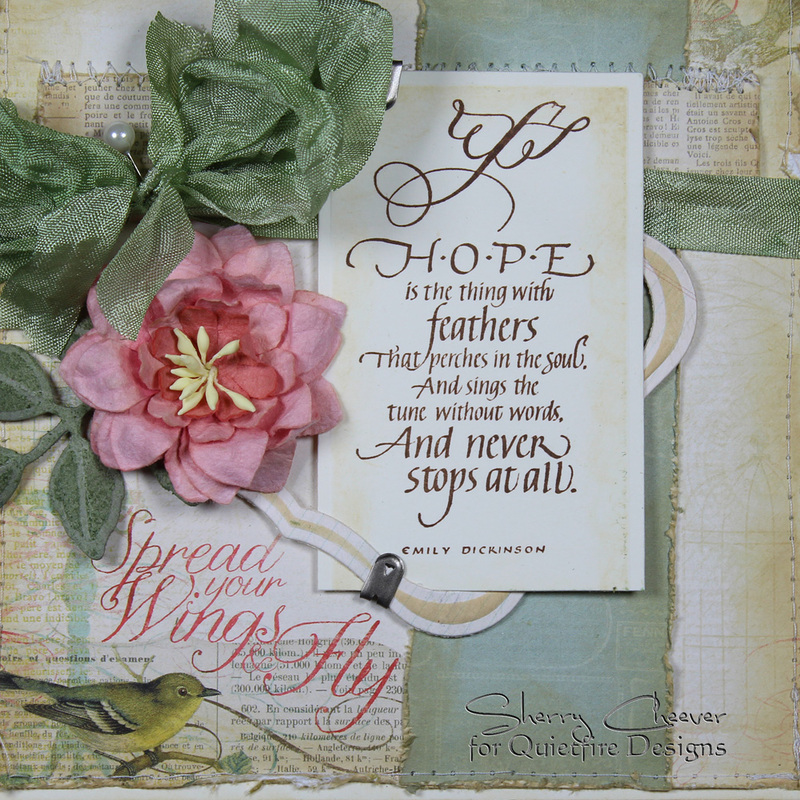 The seam binding was dyed using Distress Stains in all of the colors except Vintage Photo. Yes, Stickles was added to all of the fussy cut butterflies. Hellllooooo glitter! Isn't it the sweetest sentiment? 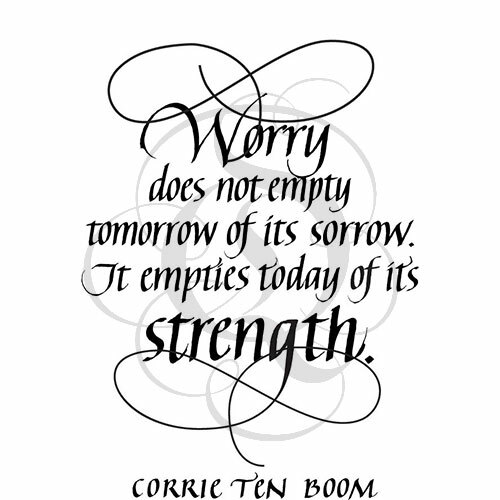 It is so uplifting and true. Definitely puts a beautiful pespective to a day! Thank you very much for stopping by! I hope you have a crafty day! found and create an ornament and card with one of the new Christmas stamps. 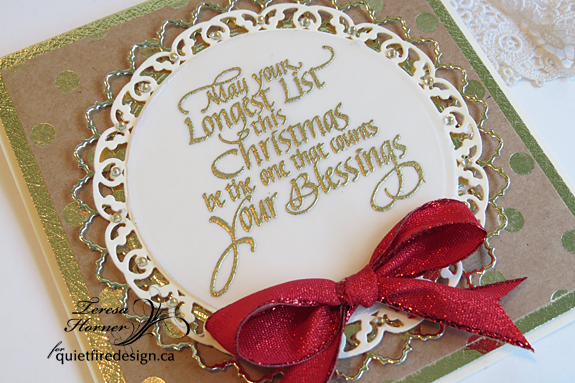 For my card and ornament i use the gorgeous new "May your Longest List" stamp. 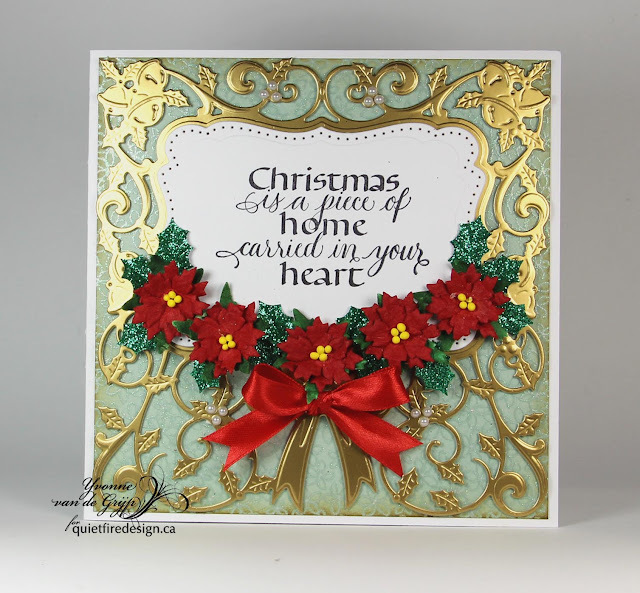 For both of them i stamped with Golden Glitz Delicata ink and embossed with gold so that the sentiment would really stand out. 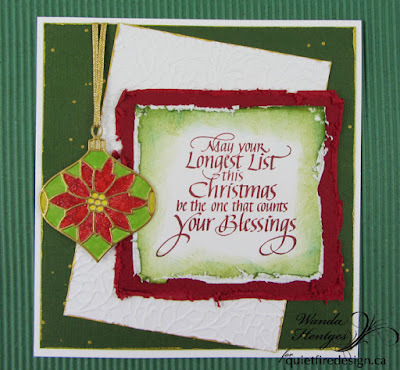 For the card i stamped on vellum and the ornament i used ivory cardstock. 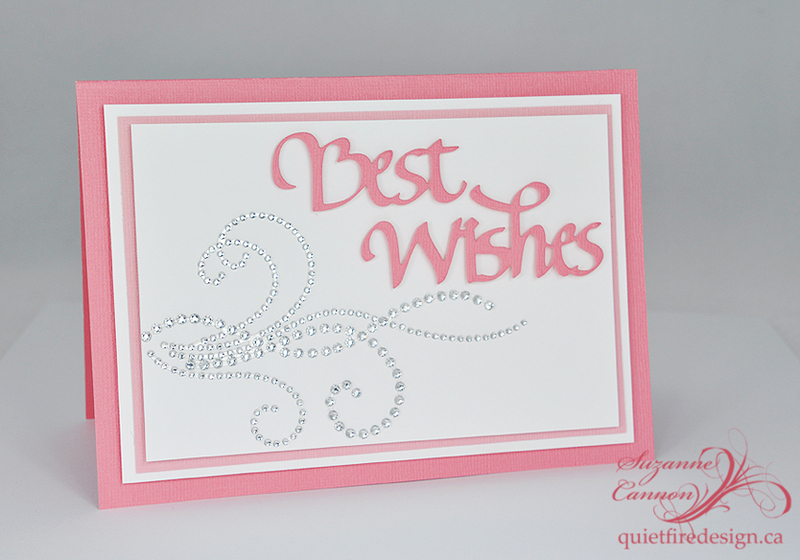 And i also used a few dies on the card and ornament to give it a little more glitz and make it fancier. 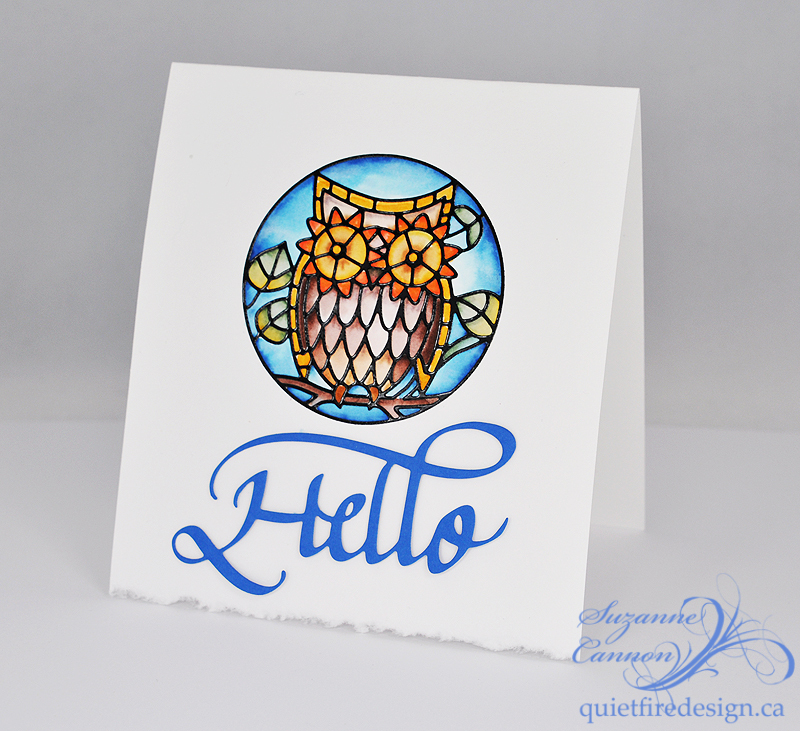 image on the ivory card stock and then used the glass to trace the circle and cut it out by hand. And since my little candy cane wouldn't fit inside i put it all together and glued it on the front. and is called 3 in 1 and it's pretty amazing for alot of hard to glue things. On a separate piece of white cardstock misted with water on both sides (to prevent curling...), dabbed Distress stain daubers in "Broken China", "Chipped Sapphire" and hit here and there with "Picked Raspberry" & "Seedless Preserves". Misted with more water and moved it around by tilting. Dried. Trimmed to size. Adhered a piece of Sari ribbon, vertically, wrapped around the edges. Adhered to my side folded my white card. 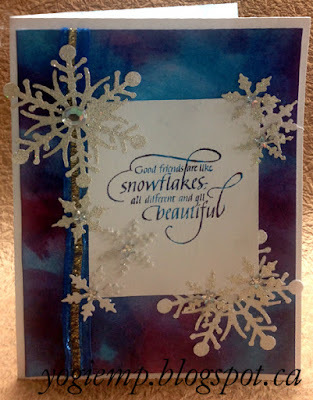 eCut and punched out a bunch of snowflakes (Martha Stewart "Alpine Snowflake"; Paper Shapers "Ruby" & "Amethyst" snowflakes) from white cardstock. Applied Versamark all over and embossed with holographic embossing powder and white/gold embossing powder. 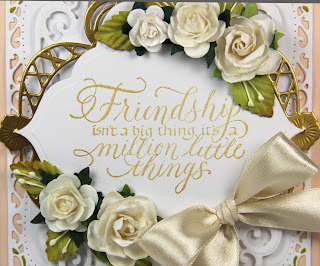 Stamped the quote ("Good Friends Are Like...") using Distress pad "Broken China" and hit here and there with "Seedless Preserves" and stamped onto white cardstock. Trimmed down. 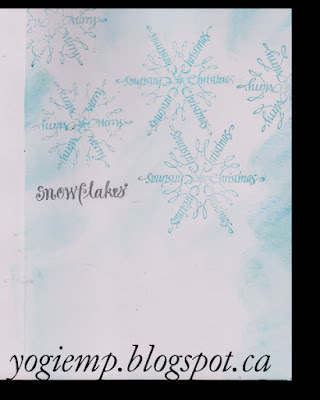 Started adhering my snowflakes and quote pieces in a pleasing manner on to the card front. A final touch was adding rhinestone stars to the centers of the smaller snowflakes and a large iridescent gem to the largest snowflake. 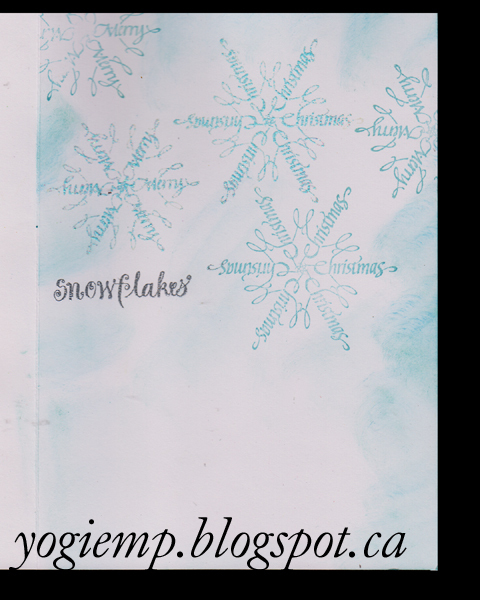 On the inside stamped the "Merry" & "Christmas" word snowflakes ("Snowflakes are Butterflies...") repeatedly using the Broken China. Stamped the "snowflakes" word with Versamark and embossed with silver embossing powder. Sponged some of the blue around the edges. 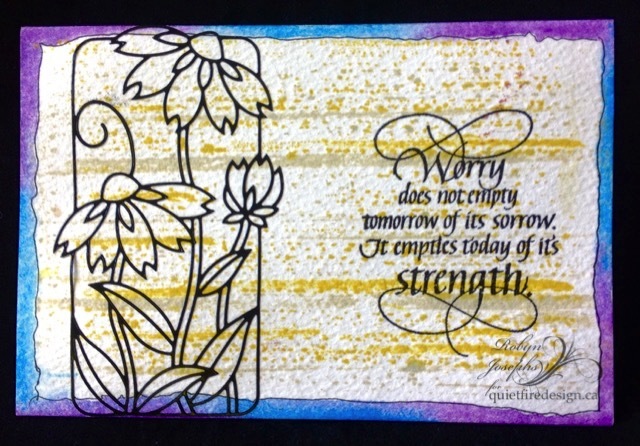 Worry does not empty tomorrow of it's sorrow-New Stamps!!! Hi Y'all Robyn here with the first inspiration of the new stamps from Suzanne's pen! I had a bunch of these watercolor postcards ready to go and just stamped the mounted sentiment in VersaFine Black and heat embossed clear. Some back story at RainbowWeaves. Hello!!!!!!! It's Wanda here today and I hope you've had a good week!! It's been a hot week here in southern Iowa. I'm sharing a card using the Hope is the thing with feathers cling mounted rubber stamp. The background started with a panel left from a play session with Brushos. 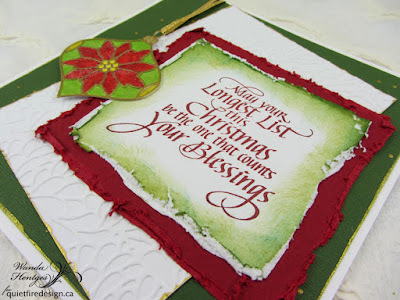 Over this I've stenciled white embossing paste. Once the paste was dry, I put the stencil back on, sponged on paint, and then sprayed with Perfect Pearls mist. After that was dry I added dots with a white paint pen and some black lines along the points. The quote was stamped with Archival Ink jet black, torn out and some of the edges curled a bit. 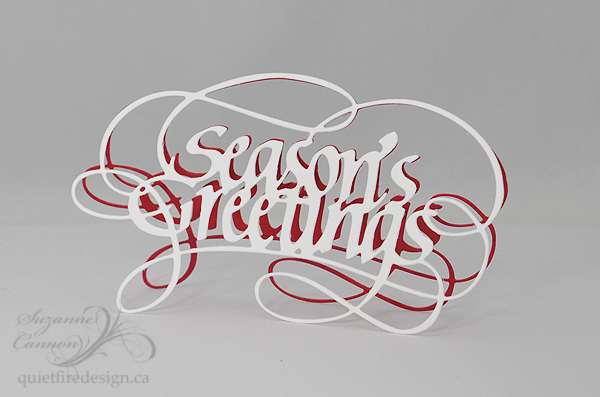 The leaf is a left over die cut. Some layering and string finishes it off. It's Suzanne here again! Whew, it's quite a week here at Quietfire! 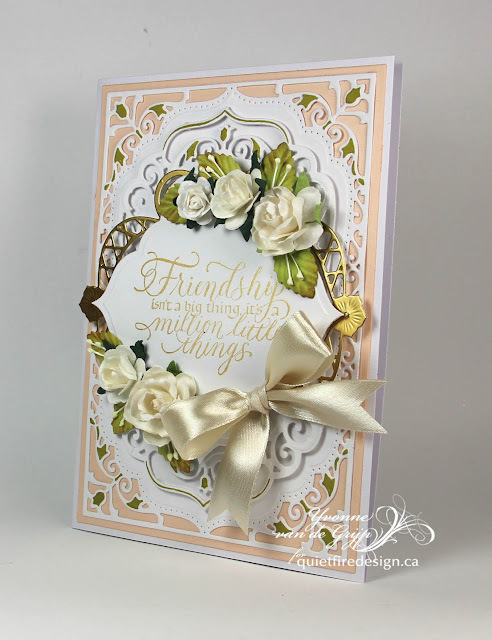 We announced our new dies from Elizabeth Craft Design on Tuesday and now we want to share our seven new stamps! They are so new we don't have any artwork to share with you yet! Sorry! You may order these now but orders containing them will not be shipping until I return from holidays, July 30th. I had originally planned to do a Christmas in July event, but there has been so much going on behind the scenes that the ducks didn't line up! 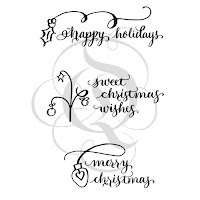 Nevertheless, we still have Christmas stamps to share with you. The Design Team will be having fun with these soon, so stayed tuned for great inspiration. For more information on pricing, sizes and to order, click on the caption links to go to the website. And every once in a while, you need a slightly naughty stamp! Here are some sweet little doodles that would be fun on tags! How many times have you seen something that would perfectly suit someone special in your life? Now we have a stamp! 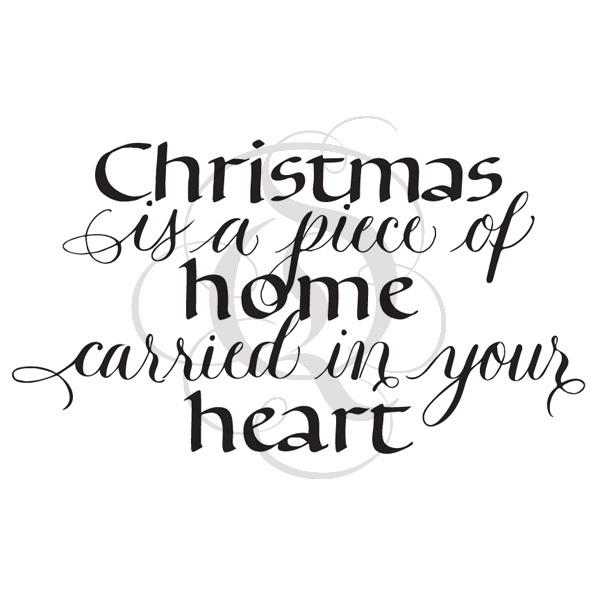 This could be used for Christmas, too, but it's good for any time you're missing someone. 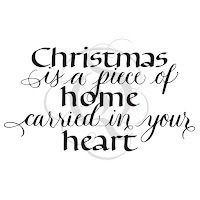 This was made with my friend Susan in St. Albert in mind, because we've been thinking exactly this for many years! And once again, any orders containing these new stamps will not be shipped until I return from holiday on July 30th. Sorry for any inconvenience. 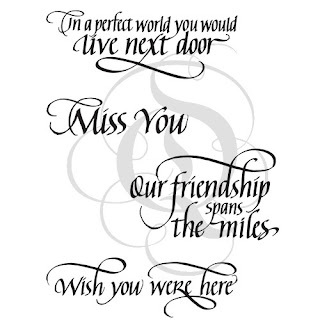 has such gorgeous lines and the sentiments are just perfect. "Friendship isn't a Big Thing"
with some matching pink, purple and ivory cardstock for the mats and base. colors and the butterfly goes with the serifs in the script so well. in the center with a bow on it. The papers for this card are from Prima also. adhesives from Scrapbook Adhesives that you can buy online in the shop. 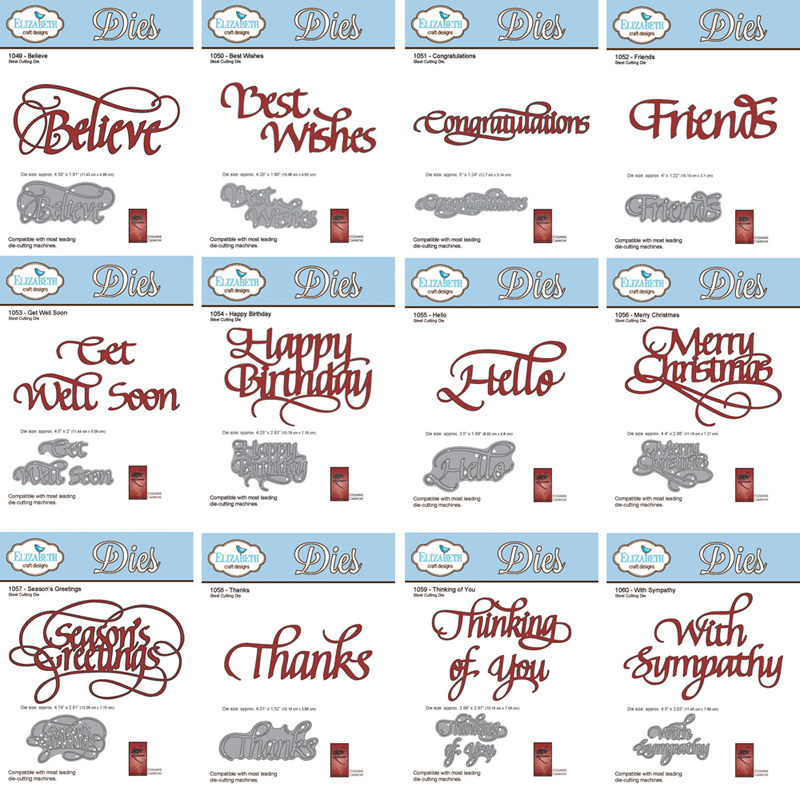 get a few of the new stamps to create something fun too. 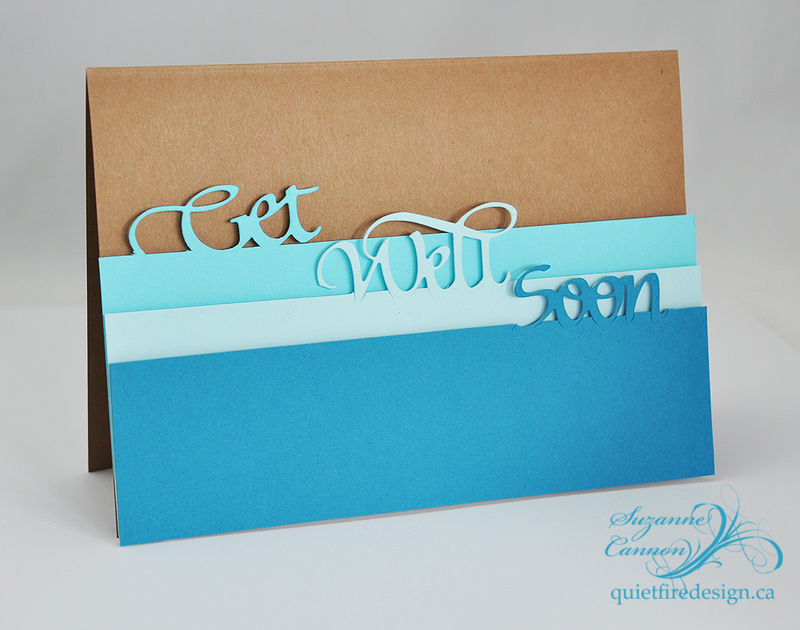 Exciting News at Quietfire Design! Happy Tuesday everyone! It's Suzanne here today with a closer look at our big news. If you receive our newsletter or follow us on Facebook, you will already be aware of the exciting changes. Thanks for your enthusiasm! For those of you who have been asking, it's time to celebrate. YES! We have new dies coming very soon. 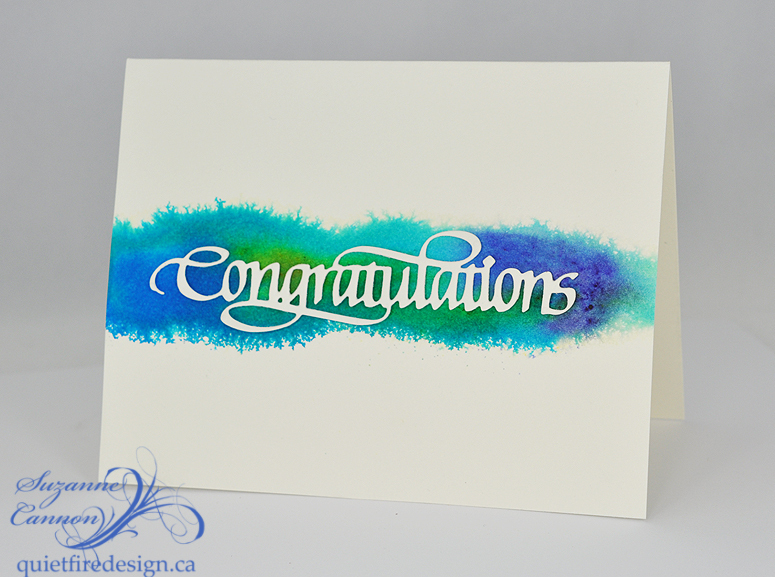 I am so pleased to be a new licensed designer with Elizabeth Craft Designs. 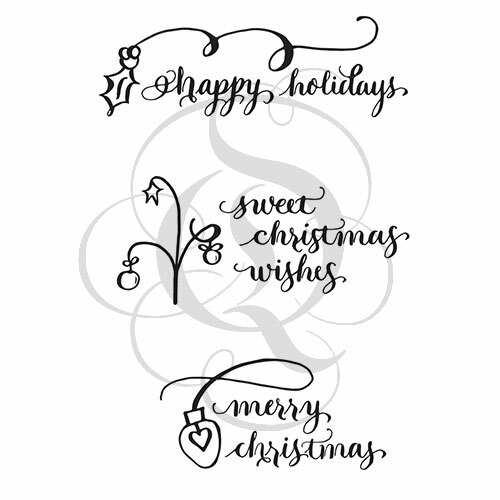 We're starting with a collection of twelve very special word and greeting dies that began as my own calligraphy - pen and ink hand-lettering (not a computer font). It's easy to make simple cards in minutes: Cut, add to a card front made of layered rectangles and embellish a bit. 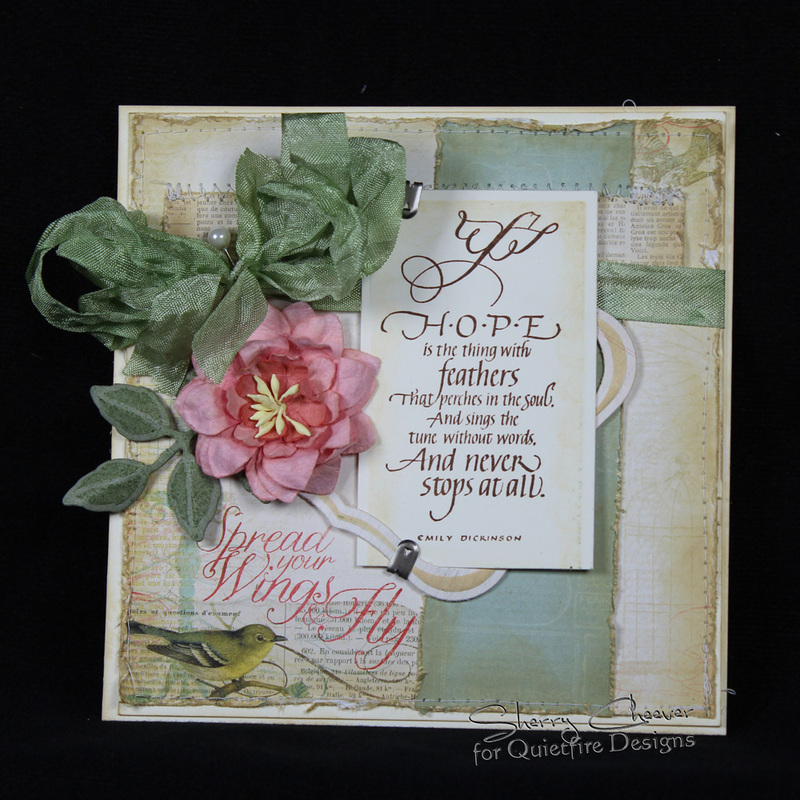 You may see the dies and packaging for A Way With Words in the Elizabeth Craft Coming Soon category. (I will be carrying the dies on the Quietfire site in Canadian Dollars later in August) If you want your local store to carry these, simply ask them to contact Elizabeth Craft. They have all the wholesale information specific to this collection ready to send. 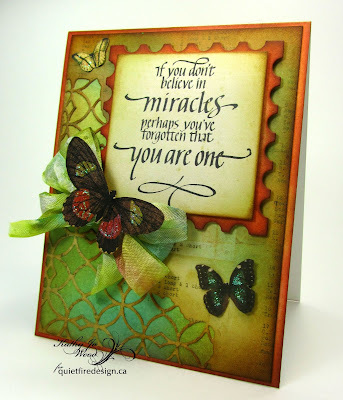 Dies will ship to stores the first week of August and sales on the Elizabeth Craft site will open next week. 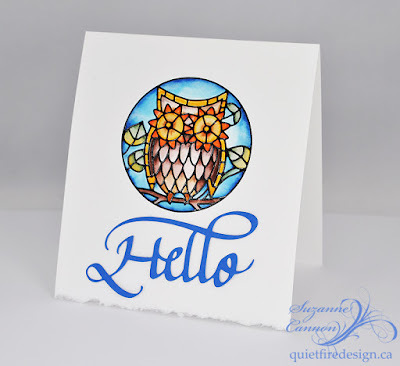 We'll be sharing lots of projects here and on the Design Team personal blogs and you'll see our dies used over on the Elizabeth Craft blog too, so make sure you're signed up for their updates. Videos and tutorials will be coming soon! Here is the whole collection. Stay tuned! 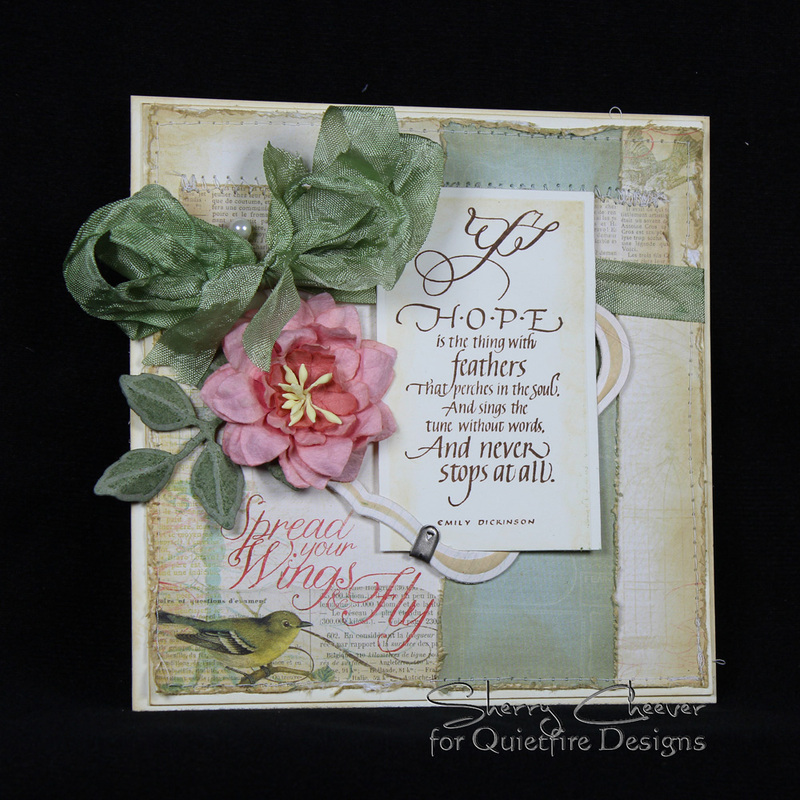 We'll unleash the Quietfire Design Team soon and you will be delighted with the infinite ways you can create with these dies. And don't underestimate the power of mixing and matching! We look forward to seeing what you can do, too! 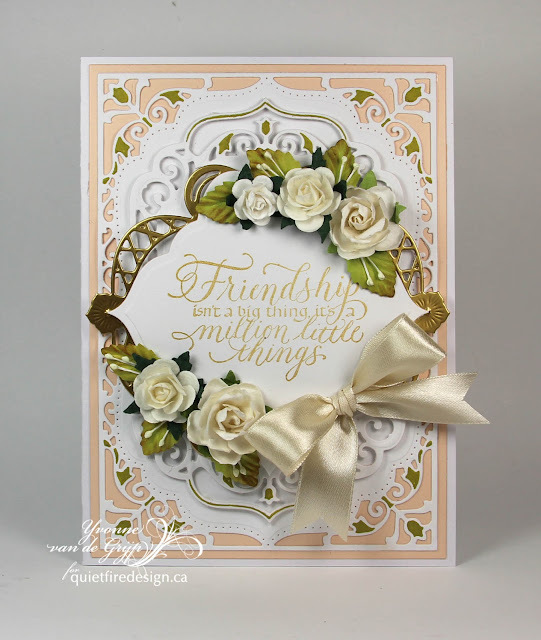 Yvonne here with a card using one of the brandnew Quietfire Design stamps: Friendship isn't a Big Thing. I love this sentiment...it's perfect for letting someone know how you appreciate him/her. The card I made is all about simple layering of die-cuts and to soften the card I used gold ink for stamping. Happy Friday Everyone! Terre here with a delightful birthday greeting! I don't know about you but I love to get my hands dirty, when it comes to blending my colors. For this birthday card I used Quietfire Design Happy Birthday Plain & Simple Stamps. 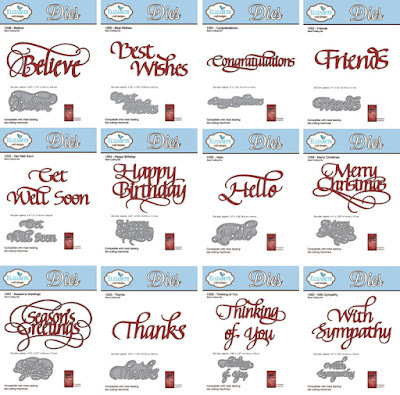 This stamp set has all Happy Birthday written in 7 different sizes, just perfect! 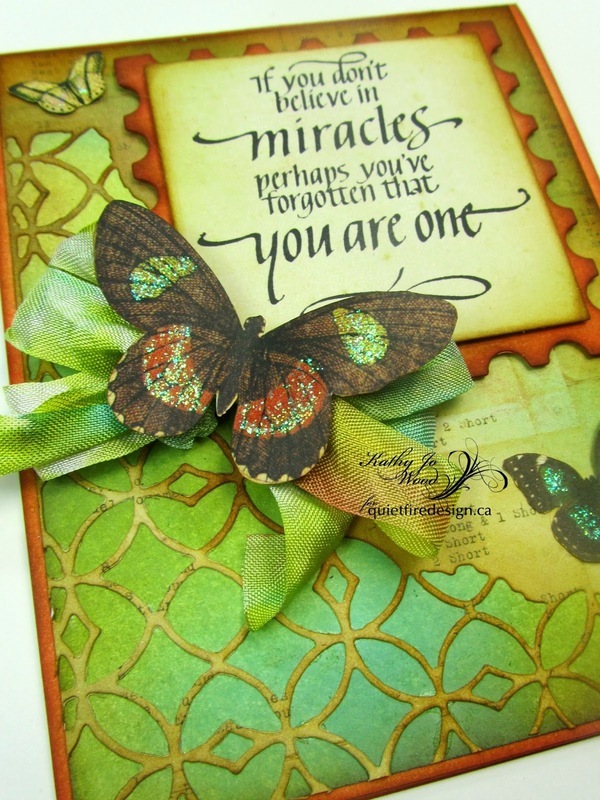 I used Spellbinders Delightful daisy 3D Em- Bossing Folder, colored the flowers and butterfly using Imagine Crafts/Tsukineko Memento Ink. The wonderful paper collection Sweet Sentiments is from Graphic 45 and I put it all together using Beacon Adhesives Zip Dry. Good morning! Sherry here with you today and I have a card to share using Hope is the Thing with Feathers. 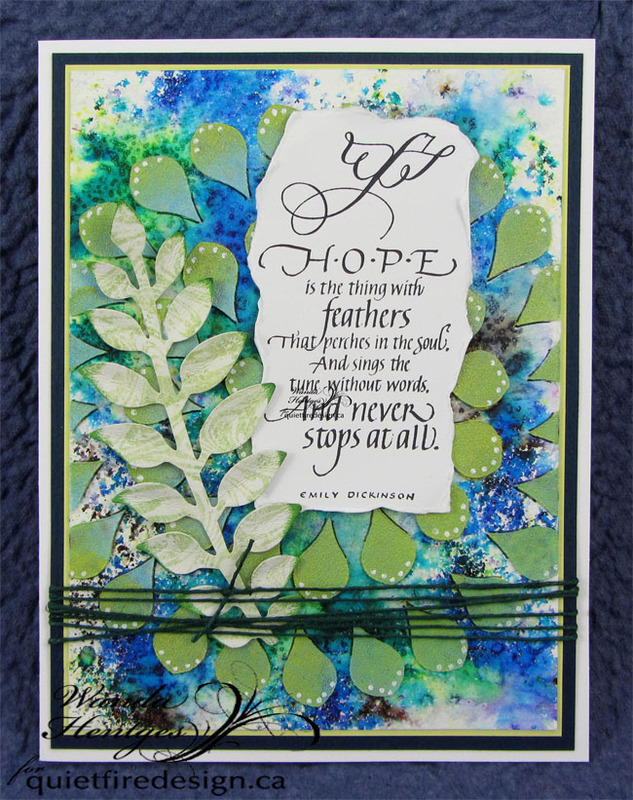 I decided to use up some more old paper from my stash (MME Lost & Found Market) by layering different scraps on top of the other and stitching them all into place. The sentiment was stamped in Ranger Archival Potting Soil and then die cut using long rectangles. 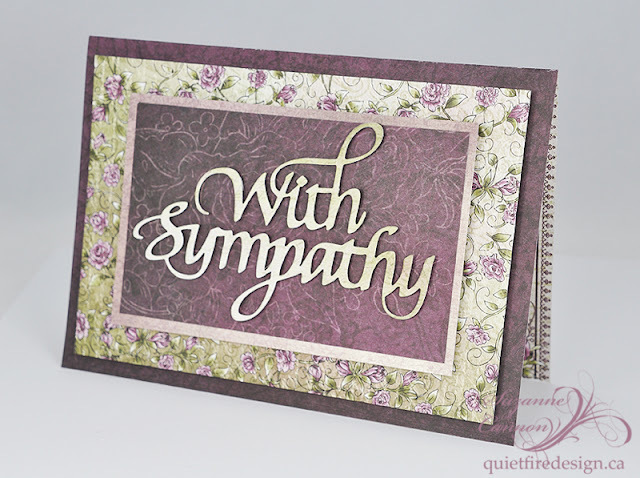 A frame was made for the sentiment using Labels One die templates. 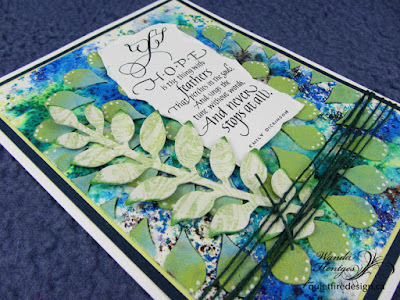 The flower is another from my Prima stash and the leaves were some I had already die cut from Grunge Paper, which were inked with Bundled Sage Distress Ink. The ribbon was dyed with Bundled Sage to match. I suppose that’s all I have today. Thanks for stopping by and joining me!